It's finally time to begin my HT 2.0 Build so I figured I would start a dedicated Build Thread here. 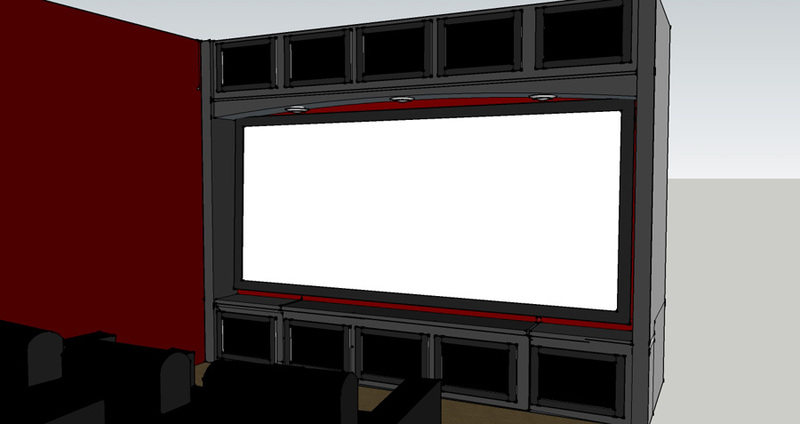 Wakejunkie is getting ready to begin construction of the new front cabinet wall and this evening, he sent me the final sketchup file that he designed and needless to say, I'm PUMPED!!! The screen will have two hidden latches (similar to door handles on a car) that will release the screen. Gas shocks will hold the screen open. The bottom three middle compartments will be able to slide forward via a 500lb max capacity commercial rail system. This will allow for MUCH easier access to the rear components. The RSW-15 will be moved underneath one of the main LaScalas. Here are the latest renderings from Wake but they do not show the Lighting under the curve and the rear view does not show that the top cabinets will be actual cabinets. Looks like you just created a boat load of room to accommodate multiple horn subs. 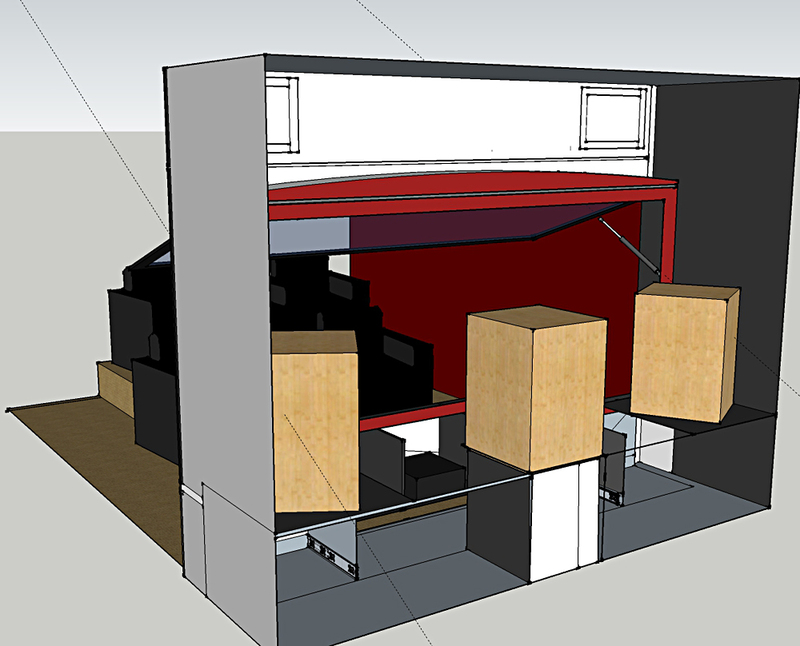 Sketchup model looks great by the way. Yes, it should leave some options for future sub expansion if I choose to go that route. A vertical horn between each LaScala or lay the horn on it's side and use it as a riser for the LaScala. I believe there is 36" depth I will have to work with. Michael, Add a second RSW-15 and you will be in heaven ! Oh I would have no problem having dual RSW-15's. I'm just waiting for the right deal to come along again. Okay, yeah, that's very cool. Totally dig the way the screen opens up. 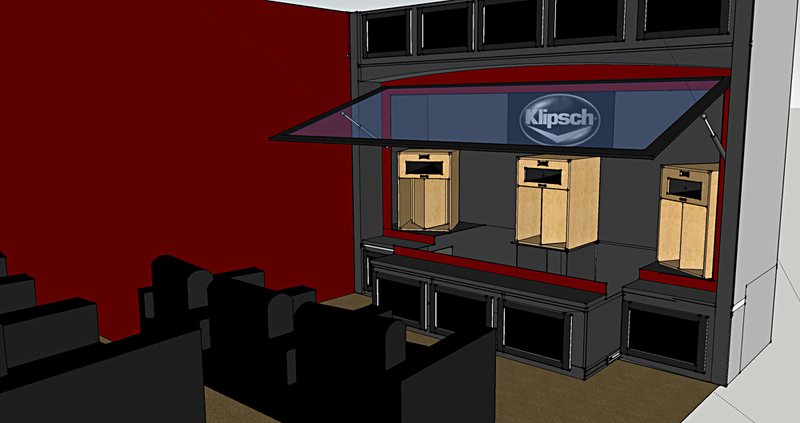 You HAVE to be sure and have the Klipsch poster above the center LaScala. Perhaps a mural that fills the whole wall behind the screen might be in order? Its gonna be a fun build. Have fun! Your setup is going to be awesome! I would seriously consider going to some horn loaded subs though. I had some friends over tonight and I demoed my untuned room to them, and they walked away with big smiles on their faces. 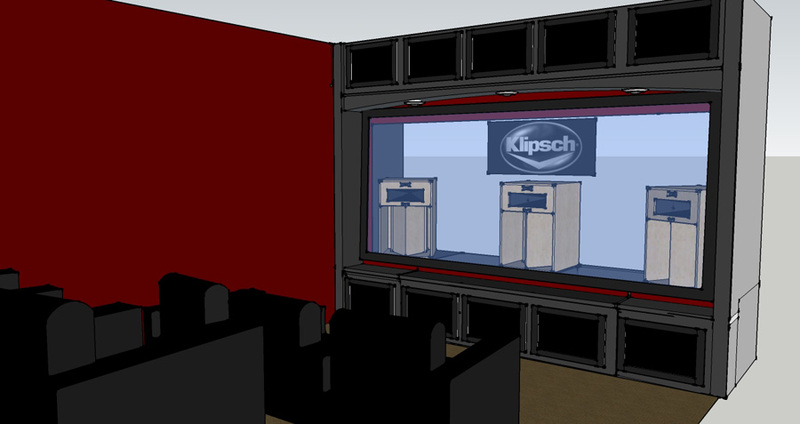 The Danley DTS 10 subs rocked hard! One thing I noticed was the base had the same clarity of the horns , and 1/4 pies. My friends comment about how the whole setup was crystal clear, and distortion free even at reference levels. We watched the Chemical Brothers video for over one hour at reference levels and had absolutely no problems with the sound hurting our ears, which I was fully expecting at those levels. 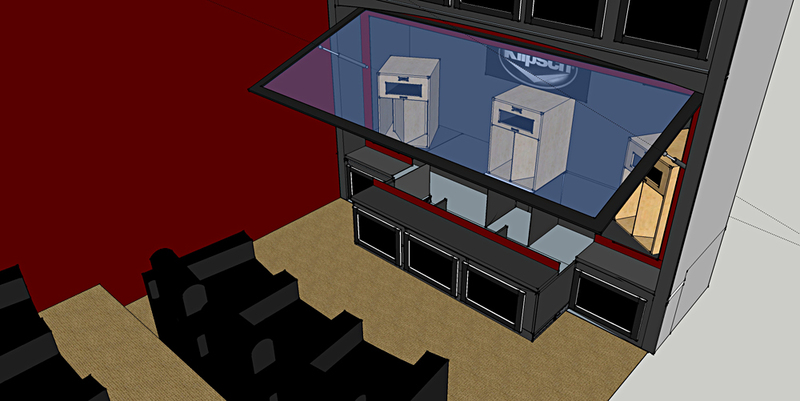 I have updated the drawings to show it in the closed position and added the lights. Nice HT room. I was wandering if the sound from your mids and tweets will go right over the top of the people sitting in the front row? Looks great and good luck. As mentioned above i would wait for a horn loaded sub. My la scalas never sounded right with the sealed servo 15 i had and once i got my thtlp it was night and day differance. I was thinking the same thing. They could always be angled down. I kept scratching my head the whole time I was reading.. "Doesn't Michael know that this many speakers does not = 2 channel?" I see you don't have room to build my Quarter Pie horns, which outperform LaScalas by a LOT with a K33. That being said, you treble section is too high. A simple solution is to just mount the LaScalas upside down, which I did do when I had a double stack of MWMs woofer under mine, and it worked. You will thank me later. I probably won't know until I get it all setup whether or not I'll need to angle them downwards some towards the LP. 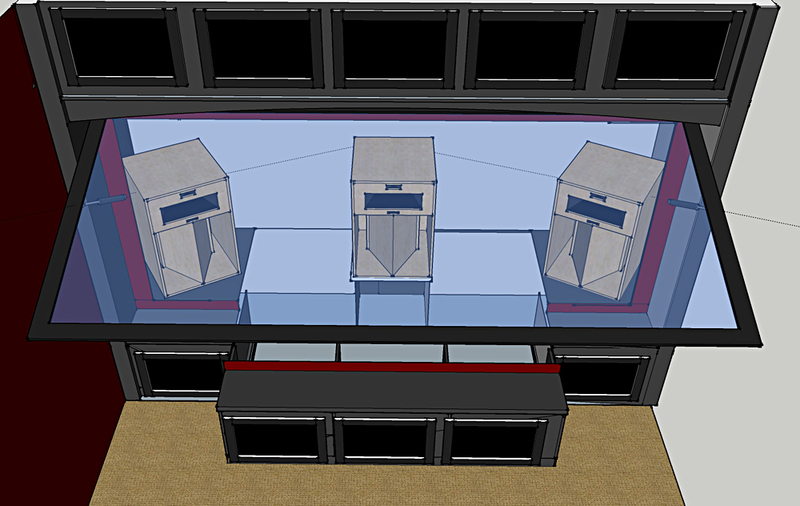 I could elevate the LaScalas to the same height as they are in the drawing but it will be different as they are currently 3-4' closer than what they will be when they are installed behind the screen. My la scalas never sounded right with the sealed servo 15 i had and once i got my thtlp it was night and day differance. So far, I love the RSW-15 with the LaScalas. No complaints whatsoever. I kept scratching my head the whole time I was reading.. "Doesn't Michael know that this many speakers does not = 2 channel?" ..then i realized it was version control.. Haha.....I didn't even think of that. Yeah, in the AVS forum, often when someone redesigns their HT, they call it 2.0 as in Version 2. I see you don't have room to build my Quarter Pie horns, which outperform LaScalas by a LOT with a K33. Wow, those are huge. They look to be around 4x the size of the LaScala footprint. That being said, you treble section is too high. A simple solution is to just mount the LaScalas upside down, which I did do when I had a double stack of MWMs woofer under mine, and it worked. You will thank me later. Yes, I mentioned that in several previous threads too. It's hard to "imagine" what it will sound like as there isn't an easy way to test it with the current false wall in place. I tend to agree that the La Scala will be too high. That said, doesn't that mean that the screen is a tad high as well? Mine drops lower than yours, and my La Scala starts off on the floor so is much lower than your plan. Really like the SIGNage idea; have you fleshed out plans for it, yet??? Actually....she mentioned that to someone the other night. Think she wants to be able to do T25 on something larger than her laptop. LOL No, that was Shaun's Idea. I'm guessing it's just for looks, not a real sign.